The primary objective of inventory and warehouse management systems is to establish control of inventory levels and processes, and understand the costs involved with running a warehouse. Warehouse systems can have the greatest features in the world to prioritize shipments, act as GPS for order picking teams, and analyze shelf capacities. However, all these great benefits will get your business nowhere if your team are sending out shipments with incorrect contents and labelling, or if your inventory is wildly out of control. In this guide, we’ll walk through the core workflows that any retail business must get right in the warehouse, discussing how barcodes and supporting software eliminate shipment errors and offer rapid fulfillment. There’s a neverending list of business-wide activities that can help you to improve your KPIs, but performing inventory counts in the warehouse is at the heart of it all. Without regularly counting your inventory, you’ll be open to inaccuracies from damage, theft or data entry errors. This will trickle through your business, causing discrepancies in financial reports, or negative reviews left by upset customers who ordered something that was no longer available. Regular inventory counts will not only provide more accurate inventory numbers, but they will also allow you to diagnose the process gaps that lead to damage, theft or data errors. The benefits of regular inventory counts are clear, but many businesses fail to perform them regularly, most of whom cite “it’s too much effort.” Without a system to help, counting your inventory can be a lot of effort - if you have a large warehouse and broad SKU catalog, then of course it’s going to take a long time to complete a full count of inventory. Even more so if you’re doing so on paper (because once you’re done, some poor soul is going to have to type the numbers into your inventory system! And more data entry errors are likely to arise from that, creating a vicious cycle)! Complete your inventory counts using a dedicated tool that allows you to scan a location, then scan all the products within that location before moving to the next, resulting with a completed list that can then be reviewed, accepted, or rejected before updating your core inventory levels. With the above solution alleviating the risks of miscounts, and reducing the time required to enter updates into your system, inventory counts can be performed more often to help cut down on discrepancies, and improve your inventory control. This doesn’t necessarily mean performing a full inventory count more often - this is where cycle counts can help. A high risk count will be a list of all products that have historically had the largest discrepancies during counts, are prone to theft, or have had the most inventory corrections performed against them due to breakages, returns, etc. Performing high risk counts will enable you and your warehouse team to discover exactly why these products are resulting in so many write-offs, so you can then work to mitigate them. High value counts are exactly as the name implies - a list of products that have the highest cost, or potential sales value. Prioritizing this selection of products will ensure that your most cash-intensive products are well understood, and again, any errors can be uncovered swiftly and mitigated. Use high risk or high value cycle counts to reduce the time spent on counting inventory. High risk counts ensure you’re keeping an eye on any items that historically have had the largest inventory discrepancies or those that are prone to theft, returns and breakages. Whilst, high value counts allow you to prioritize those items that have either the highest cost or potential sales value against them. In summary, implementing an inventory management system and equipping your team with barcode scanners will deliver improved inventory management through reducing the effort, and increasing the frequency of your inventory counts. Let’s talk about inventory actually arriving at your warehouse doors. Whether it’s a delivery from a vendor against a purchase order, a customer order against a product return, or an inventory transfer from another warehouse, your team need to be tooled up with what was expected, so that they can police the quantities and products that have arrived and accept or reject appropriately. Due to unintegrated systems, or the time it takes to count large deliveries, the reality is that the above doesn’t happen, and most warehouses will blindly accept the delivery and let their operations or purchasing manager deal with the reconciliation later. This can lead to disputes with vendors, customers and other stores - the first two inevitably resulting in the business suffering the cost themselves in order to maintain a good relationship. Empower your goods-in team with access to what’s expected so that they can reconcile against expected inventory on the spot, and barcode scanners so that this is a quick process that mitigates the human errors of accidentally selecting the wrong item. A huge benefit of integrating your deliveries with your warehouse operations is that they’ll have visibility of what’s expected, and can arrange their workload to accommodate as needed. The team can work then to ensure there’s adequate staff on busy delivery days, and also can feedback if they would prefer the purchasing team to try and stagger deliveries to avoid certain dates or times. The best practice for most businesses is to aim for afternoon slots, so the warehouse team can deal with customer order pressures or inventory count activities in the morning, and clear appropriate space ready for the afternoon. Next is the core workflow that dominates most of the working day, and has the highest throughput: actually preparing and sending shipments out to customers. For the majority of retailers, more success means more shipments and therefore, more risk of human error. Process flaws that lead to shipping errors should be addressed immediately before they severely detriment your growth. Starting with order picking, where an order picker is granted with a shopping list of products to collect in the warehouse and return to the packing desk as quickly as possible, the chances of them accidentally picking up the wrong product varies from business to business and product to product. For some, it’s not an issue: if you’re selling kayaks and barbecues, it will be much more obvious that the wrong item was picked, than if you sell keychains and bottle openers. But for those of you who sell a lot of a very similar item, or at least items that are all packed in near-identical packaging, we could start seeing serious issues arise. (I recently visited a customer selling contact lenses, and their warehouse was just an ocean of tiny white boxes)! In this situation, pickers will either be taking way too long to perform their pick, or they’ll commit picking errors. Arm your team with a mobile device and a barcode scanner so that as they pick items off the shelves, they can scan its barcode, and then their gear will alert them if they pick the wrong item. This will speed up their picks and reduce picking errors, ultimately reducing your processing cost per order. The next stage within the workflow, Packing, can prove to be another area that’s prone to human error and become a bottleneck. As described within Picking, similar looking items or just a busy environment can lead to packers accidentally placing the wrong product in a package. Arm them with the same gear as your picking crew (although it doesn’t have to be mobilized this time), and they’ll be able to scan a packing note to bring it up on their system, and then scan items into the package to ensure that they don’t pack the wrong item. Once everything has been packed, their software will update itself to reflect that, and print a shipping label if this hasn’t already been prepared. These solutions may seem obvious, but it’s surprising how many busy warehouses are struggling through without any technology, and are just accepting the errors and risk of customer fallouts. 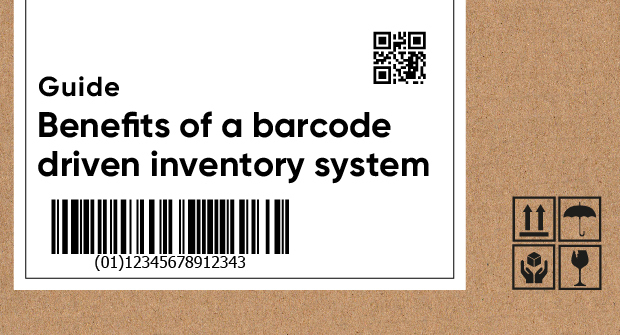 Implementing barcodes here will mitigate errors, and speed up the workforce. Implementing a warehouse system that’s designed for barcode scanners as the main input can completely revolutionize a warehouse’s operations. The system will tightly integrate the department with the rest of the business, closing gaps on deliveries or inventory management issues, and the new hardware will save your team time, and reduce errors through all workflows. Brightpearl, combined with the Warewolf warehouse management system will allow you to seamlessly manage your inventory counts, deliveries and shipments in a single platform. Check out how Brightpearl’s WMS can save you time and money in the warehouse.